I'm visiting here today as part of a wonderful Great Escapes blog tour. I'd been here previously, too, and had fun reading about our hostess, Angela Holland. In addition to all the other wonderful things about her, like how much she enjoys reading, she has a house full of pets! I can identify with both: loving books and pets. Of course, as much as I appreciate the cuteness of cats, the pets I love most are dogs. Nearly everything I write these days contains dogs. 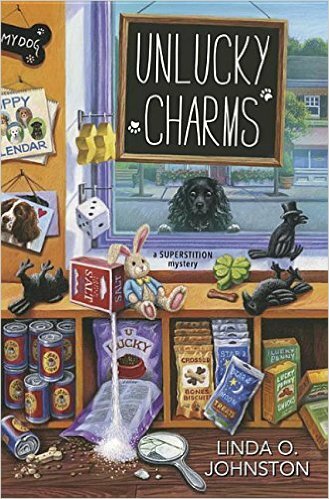 That includes my new Superstition Mystery, UNLUCKY CHARMS, the third in the series. My protagonist Rory Chasen currently is the manager of the Lucky Dog Boutique in Destiny, California, which is all about superstitions. If you're familiar with the series, you'll know that Rory came to Destiny a while ago because she wanted to know more about superstitions. Her fiancé had died after walking under a ladder, and she wanted to learn if there was really any connection. Of course she brought her beloved spaniel-terrier mix, Pluckie. She learned quickly after her arrival that black and white dogs are considered lucky, especially if you're on your way to a business meeting, since Pluckie saved the life of Martha Jallopia, owner of the Lucky Dog shop. Martha asked Rory to stay and run the shop, and she did. Now, there are lots of superstitions relating to animals. For example, nearly everyone knows that black cats crossing your path are supposed to be unlucky, but that's only in some cultures. Elsewhere, they're lucky. But I didn't decide to include animals, like Pluckie, in this series solely because of the superstitions relating to them. It's more because I simply love dogs. And, fortunately, themes relating to dogs appear to work out well in cozy mystery series like the Superstition Mysteries as well as my Barkery & Biscuits Mysteries where my protagonist Carrie Kennersly, a vet tech, owns both a bakery for human treats and a barkery for dog treats. Of course she is owned by a dog, too: Biscuit. And as with Rory, people keep getting murdered there... and my protagonists are always busy solving mysteries as well as taking care of business and their beloved pets. Guess I'd better run and see what she wants. But I'll soon be back at the computer--writing more mysteries involving dogs! Hope you enjoy UNLUCKY CHARMS. And remember, it's good luck to read the Superstition Mysteries by Linda O. Johnston! 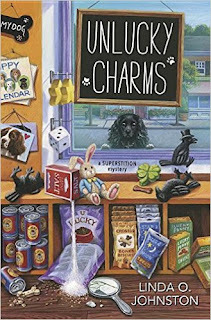 This is a great series and I'm really looking forward to reading "Unlucky Charms". These are sweet books. I am looking forward to reading the latest. Sounds great can't wait to read this book.